Here's the thing about reading three books at the same time: it's confusing. Which book do you really want to read? First. (You want to read all books if you're like me). I was going through a slow patch last month, and really, didn't feel like doing anything. Even reading. (Horrors!) So I picked up three books at the same time (never take medical advice from me). Now, of the three, Gary Davies' book moves the fastest. Unfortunately, it's an ebook, and so not as amenable to being read in all sorts of places (it's weird to open your laptop and chuckle in a doctor's waiting room, for example). So it ended up being the only one of the three I haven't yet finished. You have in it Johnny Goth, who has special powers (like extra-keen super sight, hearing and strength), but who's been taken away from Goth Mountain by his mother, since she doesn't want him to disappear, like his father did. He's engaged to Angela because she wants it that way. He has a watch with his father's image engraved on it, along with his own. The images age. In the meantime, near Goth Mountain, Fenster the logger wants to grab the mountain so that he can cut the old-growth forests. The native Americans on the mountain will not stand for it. There is the teacher, Elizabeth Winters (we all know she will end up with Johnny Goth instead of Angela), and Johnny's childhood friends, including Dooley Simple who convinces the bark of several trees to grow in smiley shapes, the shaman Two Bears, and the shape-shifting Ned. Ranged with the villains are Skunk Fenster, the goonish nephew of Fenster the logger, the Sheriff (owned by the logger) and Mr Dark, an evil entity that feeds on humans and other beings. Of course, given that the market is for white males, Johnny is not a native American. Duh. Yep, shenanigans all around. A Wild West story with supernatural beings. Keep tuned. I'll write it up later. bribes for cases, blackmailed by lawyers who found her guilty secret. Larry Starczek the detective who ran the original case, is still trying to get somewhere with his true love, Muriel Wynn, the prosecutor. Both are married to other people whom they don't love. The reopening of the case throws them together. The story see-saws between Arthur's team proving the client innocent, and Muriel's team proving their case was solid all along. Except that both sides are being played. As each side sees an ascendant in their case, so do the two couples, Arthur and Gillian and Muriel and Larry, seem to come together. As their cases slide downward, so do the relationships. Since I'm not going to spoil the end for those who want to read the book, let me say that one relationship survives, and the other crashes, exactly in tune with the respective cases. Yeah, wait for the last chapter. It's a decent whodunit as well; don't get misled by the author's emphasis on the relationships. Mad Ship is the second book (of three) in 'The Liveship Traders' series. As usual, I hit a series in the middle (what's with me??). This book is the slowest moving as well as the fattest of the three books. Most series authors walk a line between writing the second book for the fans of the first, and writing it for new entrants like me. Robin Hobb, aka Megan Lindholm, takes you on a round of introductions of practically every character who populated the previous book, including the liveships, so I'm guessing she chose the first option. Liveships are constructed of wizardwood, and are 'alive'. They are characters, too. A liveship with a good relationship with the crew and trader family it belongs to, can outrun any other ship on the world. Bingtown, where the Traders live, pays rates and taxes to the Satrap of Jaimillia. Unfortunately, the new Satrap is a spoilt teenager who is tying up with the villainous Chalcedeans. Along the Rain Wild River are the Rain Wild Traders, a secretive and deformed group who are the only source of wizardwood. The river eats any other wood than wizardwood, so only Bingtown trades with them. There are also pirates, led by Captain Kennit, who wants to be King of the Cursed Shores, the only human-populated part of the planet. Liveships need a family member aboard. Vivacia has been taken over by Kennit, but Althea, the daughter of its old captain, still hopes to wrest it from her brother-in-law, Captain Kyle Haven (not a Trader-born), who has turned slaver to save the family's fortunes. Kennit is trying to corrupt her nephew Wintrow, but she doesn't know that. Having proven her ability to run a ship on Ophelia, she is torn between her newly rediscovered love Brashen Trell and Ophelia's captain's son, Grag Tenira, who loves her unrequitedly. There is Amber the beadmaker and wizardwood carpenter, who is on the side of the slaves and also on the side of the mad ship Paragon. Althea's sister, mother and niece are wondering whether to let her niece, Malta, marry a Rain Wild trader, Reyn. Reyn's mind is being torn up by the dragon who lives in the last dragon egg (the shell of which is wizardwood), because she wants to be freed. Sea Serpents are trying to retain their sentience, and dying out all over the planet. The Elder Race, which lived alongside the dragons, died a long time back, and only the Rain Wild people have deciphered some of their secrets. By the time I was finally engaged with the story, I was 6/7 of the way to the end. And it bugged me that the end of the story is in part 3. Fortunately, I can guess what will happen, muwahahaha. It's not a bad book by any means, well written. A liveship is an interesting concept. But too slow. Also, as usual, I wonder why people have to revert to Victorian customs in fantasy lands. Especially when it's clear they came from Earth at some time in the past, and well into our future. And, drat, I read two more books in between. So I'll write them up, too, before telling you all about Goth Mountain. Read Reversible Errors if you like legal thrillers. Scott Turow writes well. This is not his best book, though. 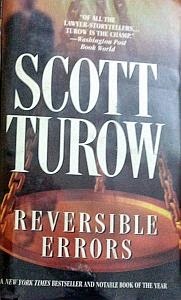 John Grisham fans will probably like Scott Turow books. 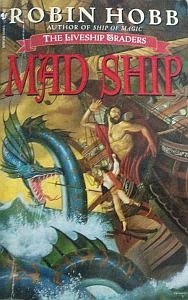 Read Mad Ship if you like complex stories with lots of characters who have emotional issues that they need to resolve. Anne McCaffery readers would like these books. 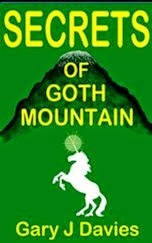 Read The Secrets of Goth Mountain if you like fantasy placed in modern settings. Light reading with happy endings. It reminds me of Disney's Hot Lead and Cold Feet. With Added Nature Powers. Oh, and it's free in July 2014.